The call was heard and answered by extraordinary Canadians. Responding to a radio appeal for milk for British children, founder Hal Rogers rallied Kin members across Canada to raise funds for the purchase of powdered milk. The goal for the first year was to raise enough money to purchase 1 million quarts; within 9 months, Kinsmen and Kinettes supplied more than 3 million quarts! By the end of the Milk for Britain campaign, the Kin family raised close to $3 million and sent 50 million quarts of milk to Britain. Rogers was made an Officer of the Order of the British Empire in 1948 to recognize his efforts as the Chairman of Kinsmen's Milk for Britain wartime project. The wartime effort helped found 41 new Kinsmen clubs and the formation of a new women’s branch of the organization, Kinettes. In order to preserve, celebrate and educate, Kin Canada clubs came together and invested in a short documentary. The documentary commemorates and celebrates the 75th anniversary of the influential Milk for Britain Campaign during World War II, which brought Kin and Canadians together to help an international community in need: Britain. 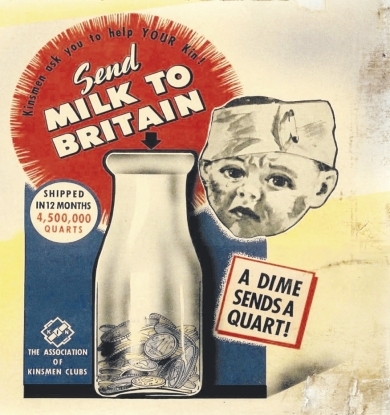 With over 50 million quarts of milk sent and $3 million raised (equivalent to $42 million today) to feed British children, the Milk for Britain story is a significant and inspirational piece of Canada's (and Kin's) history. Learnography, (formerly Curriculum Services Canada), produced the Milk for Britain documentary, ensuring the 13-minute video meets the criteria for use in curriculum plans for children and youth in grades 7-12. The accompanying Teacher's Guide provides a more in-depth look at the facts of this awe-inspiring story. The Milk for Britain documentary took home two honours from the 2017 Chatham-Kent Film Festival—Best Original Music Score and Best Short Documentary.